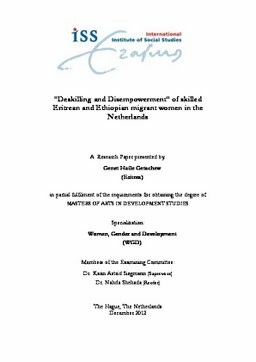 This research examines labor market experience of skilled Eritrean and Ethio-pian migrant women using qualitative research method. Empirical studies on deskilling of migrant women argue deskilling caused due to labor market struc-tural barriers. Based on the key finding the research is arguing deskilling as hav-ing far reaching consequence, which is disempowerment. Focusing on skilled Eritrean and Ethiopian migrant women labor market experience in reference to deskilling clues, how women empowered identity at risk in host country la-bor market. Skilled migrant women situated in contradictory situation both with pre-migration empowered and post migration disempowered identity. Ac-cordingly, skilled Eritrean and Ethiopian migrant women identified the pres-ence of structural barriers in the labor market. The lack of access to employ-ment proportionate with their skill are due to, lack of social network, unrecognizing foreign credentials, assumed they lack language skills, the pres-ence of intersecting identities and dominant discourse that depicts migrant women as unskilled. The data is analyzed using Naila Kabeer’s notion of (dis)empowerment by emphasizing on “choice”, which is realized through ac-cess to resource and exercise of agency. The finding indicates dealing with de-skilling and mechanism to deal with deskilling as perpetuating relative disem-powerment. This research points to the presence of skilled migrant women with in the seemingly homogenous category of unskilled migrant women who are systematically discouraged from the labor market. Hence, the need to pay attention to the heterogeneity of migrant women with in the policy making.